Lily Amelie Hayes dances at the dress rehearsal for “Fame The Musical,” presented by the Department of Theatre and Dance. The play centers around a group of dedicated performing arts students determined to become famous. 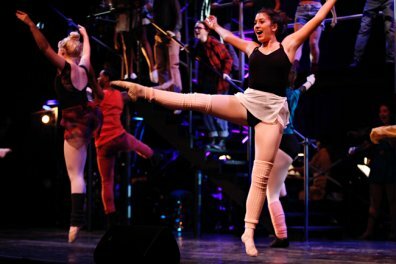 In preparation for the opening night of “Fame The Musical,” theatre and dance students worked to perfect a human staircase, a synchronized body-percussion routine and their costume changes. Adapted from a 1980s movie musical, the narrative follows a group of teenagers selected to attend a public performing arts high school in New York. UT’s Department of Theatre and Dance fall musical will run from Friday through Dec. 6. The Department of Theatre and Dance chose to put on this musical because it has a multi-protagonist plotline that allows a number of students to showcase their talent. The characters are also mostly teenagers, which gives the cast a chance to play a type of role they would get cast in professionally. Jerry Ruiz, a guest director who currently resides in New York, said he thinks the cast is different from most others because it is composed of mostly underclassmen. Among these underclassmen, Leslie Leal, theatre and dance freshman, creates a memorable moment during her solo by walking on a human staircase made up of the ascending shoulder levels of her fellow cast members. Ruiz also said he is excited to be working with a diverse cast. Although he considered that some parts were written for a particular race, Ruiz overlooked this when casting. Ruiz said a challenge typically faced when putting on musicals is making them feel realistic. His goal as a director is to overcome this challenge as much as possible. “Even though [musicals are] a heightened expression, I want to find the truth in [‘Fame The Musical’] for the actors and make sure it stays honest,” Ruiz said. Acting sophomore Max Torrez shares Ruiz’s vision. Torrez plays Joe, the comic relief, in the musical but does not want to act as a caricature. Torrez said singing is his favorite thing as well as his greatest challenge when it comes to musicals. “[The dialogue] builds up to this point to where [the actor] can’t say anything else, so they start singing,” Torrez said. Acting sophomore Trey Curtis said he drew from his real life romantic relationships and his love of music when developing his character, Schlomo, in the musical. “I believe if you can connect with the character, you’re already halfway there,” Curtis said. “Fame The Musical” particularly interested Curtis, he said, because his mom played the sound track frequently when he was younger. Curtis said his favorite memory so far on the set of the musical was when a choreographer from Canada came to teach the cast a synchronized body-percussion routine, which entails using the human body to create sound and rhythm. As far as the plot goes, Ruiz believes the story is universal and relatable.